Today I'm doing a quick tutorial with some pictures. After my nails dried I used a toothpick to make the stripes. 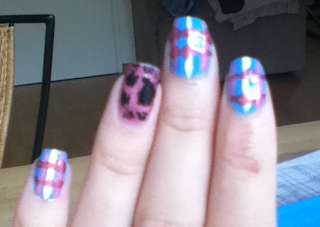 With White Lie from Topshop I made a vertical stipe in the middel of my nails. After my nails dried again, I took Sparrow me the drama from OPI & a clean toothpick. And I made two vertical stripes next to the white stripe. 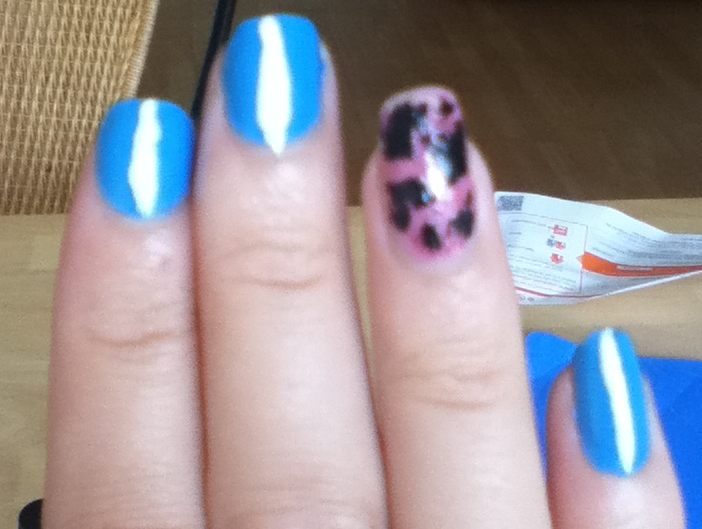 And again I waited until my nails were dry, then I took And this little piggy.... from OPI for the horizontal stripes. Next time I'm doing this nail, I will probably use a darker colour, not a almost see through glitter colour. Or I will use And this little piggy.. also for vertical stripes but then inbetween White lie & Sparrow me the drama. And don't forget to finish off with a top coat ! So this was my quick little Nail tutorial, it's not hard to do even though it takes a while. The picture I took with my new ipod that's why they aren't that sharp. But you can still see the colors and that's more important I think haha.